Now this is one cool Samurai Gundam. 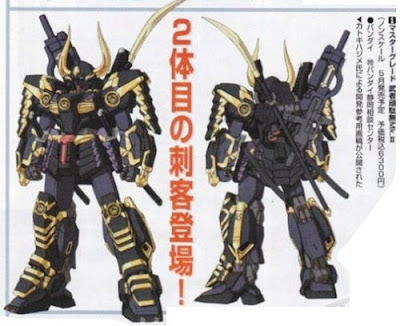 I'm not sure who designed it, possibly also by Hajime Katoki as he is the one who designed the Musha and Shin Musha - but then again, maybe I'm wrong, just a guess. I think I want this... if the leg inner frame is the same as that MG Shin Musha Gundam, surely I'm not the one who will assemble it... I personally feel it's quite difficult. By the way I found this info and photo from the famous Ngee Khiong's blog. It's TRUE that the MAKE of This MUSHA is from the RX-178 design. But for me.. i still prefer the old RED MUSHA.. not this MK II. It's more original.